As I mentioned in the last blog post, we were invited to be in the promo materials for Grasshopper cycling! We met our photographer, videgrapher, new guide and off. We went back to the village we visited yesterday and met with the sewing ladies again, and there was a lot of sweetness and laughter all around. On our walk through the village, a little girl of maybe five yelled out in perfect English, “How are you?” We replied, “good, how are you?” And she replied, “I am happy!” Then, to show off, she started singing “Head, shoulders, knees and toes” and we all joined in with her. Our HUSK guide told us that she was one of the students at the school, and a particularly bright one. Our evening was to be more riding through the outskirts of Siem Reap, but the rain came in and didn’t letup, so we instead retired to dinner at a local woman’s house. I asked her name but the guides just told me we call her “Aunty,” so Aunty it was. The food was delicious, and different than anything you get in a restaurant. I compared it to what I ate at home growing up every day – simple curried vegetables, dal, poli (roti)- to what you eat in an indian restaurant – palak/saag panner, tandoori chicken, etc. 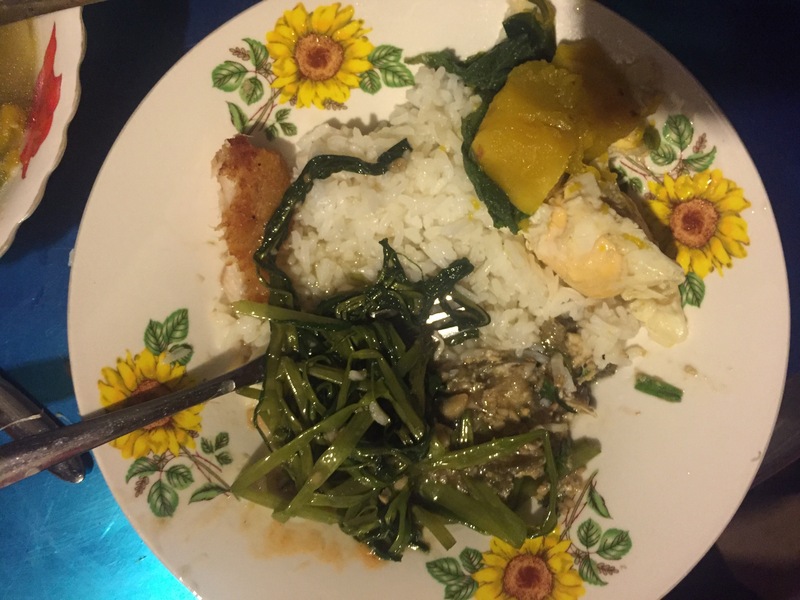 One dish was eggplant mixed with egg, another was stir fried morning glory leaves with garlic, and the third we had was a pumpkin stew, all with steamed rice. Tasty! 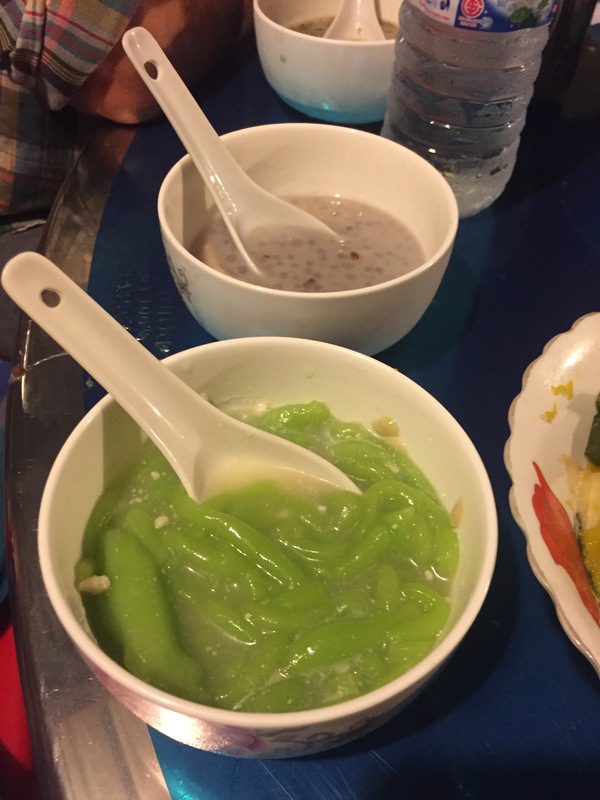 gelatinous green dessert. not my favorite. 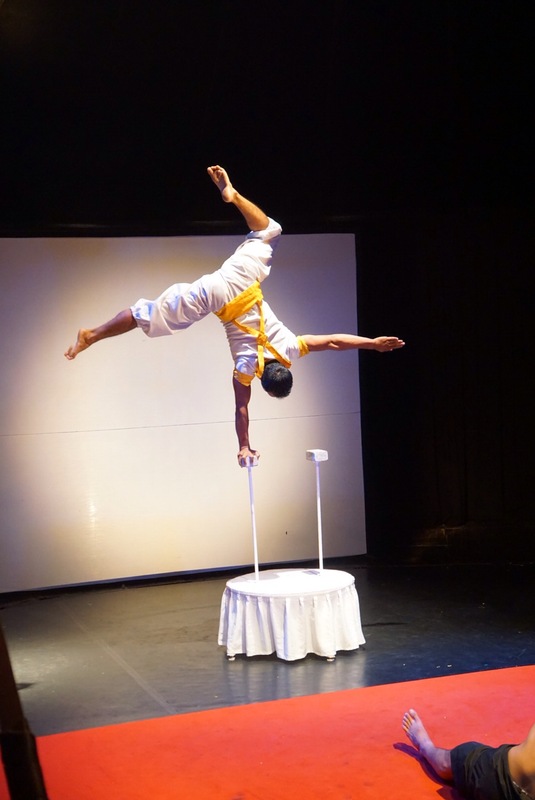 Our last day in Cambodia we did a little last minute shopping and then went to see the Phare Circus, an acrobatic group comprised of former street children, and it was heart stopping. 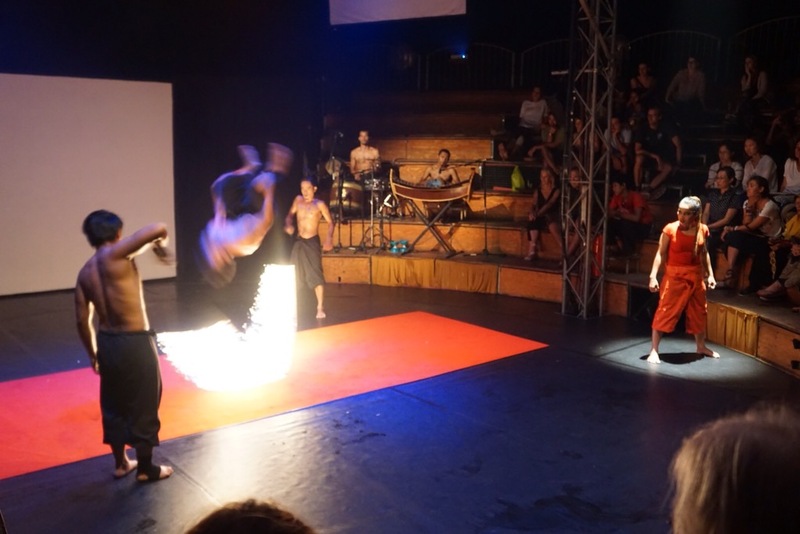 Jump roping with a rope on fire, high flips and acrobatics, arial dance, like being at cirque du soleil, only where we’re three feet away from the performers! 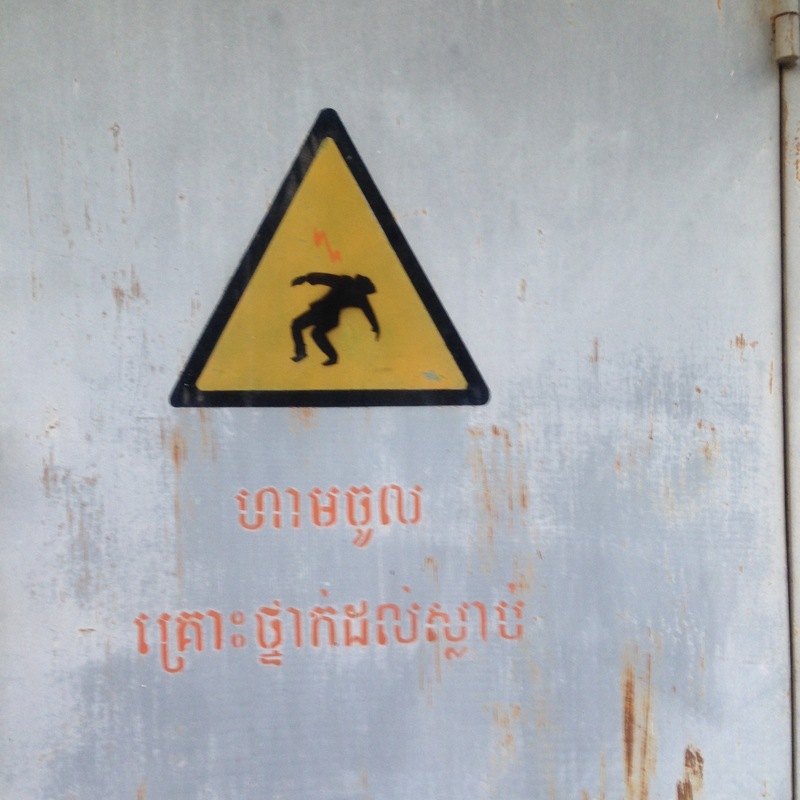 The foundation also has an art school in Battambang, where they have over 1200 students learning art & theatre, again all from disadvantaged families. This for me, was a place of wonder and also of intensity. Eric has done a better job of conveying this in his series of posts, but I know we have all been deeply affected by what we’ve seen and the people we’ve talked to. To have a country where an entire generation of thinkers and intellectuals was simply wiped out, and to leave in it’s place something of societal rubble means that there are decades of rebuilding, and it’s evident everywhere you go. The top news stories are that of the trials of Khmer Rouge leaders, those implicated in forced marriages, and again these were all forty years ago. We met so many bright young Cambodians who would be unable to get a higher education, as the system requires a lot of money and graft at higher levels. Even for a village education over the secondary school level, the government offers scholarships for poor children for tuition only. This doesn’t cover supplies, uniforms, or most importantly transportation. If the nearest school is four to five kilometers away, they need a bicycle, but the cost is prohibitive for many of these families. The real work of help in this country is ALL being done by NGOs, and there are many. 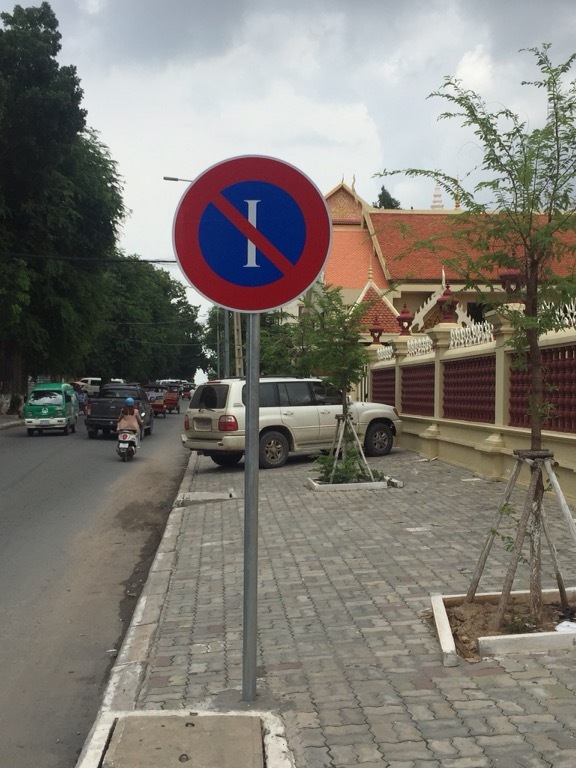 We have mentioned several of them in our posts, HUSK Cambodia, Cambodian Handicraft Association, Phare Circus, and the Khmer Ceramics Center were ones we personally stopped by and used. If you’re so moved, please click on any of the links above and give even a little – your dollar goes very far here. Everyone we met was very friendly and open, with the exception of the few times we clearly left tourist Cambodia like when I went to find hair ties in the market. People weren’t unfriendly at that point at all, we were just ignored, and fair enough. I would love to return to this country and spend more time here, coming during dry season when we can visit the beaches, the elephant rescue centers, and the other cities as well. And last but not least, the street signs! 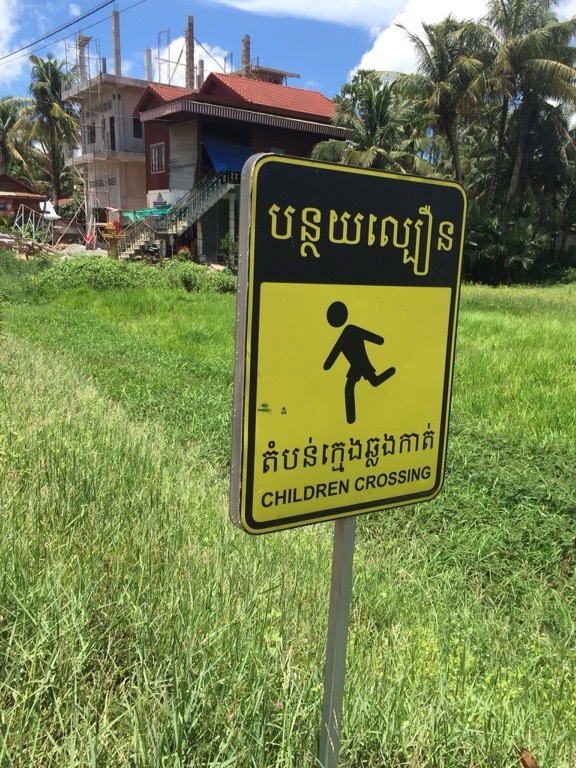 Even on the street signs the kids know to run because the motorbikes and tuk tuks don’t stop for anyone. Here is where the well coiffed children are found. 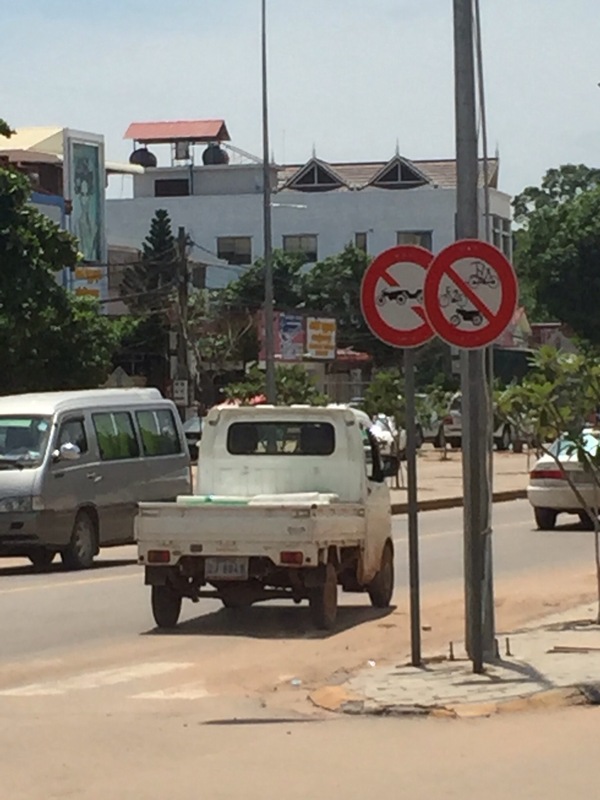 No Tuk tuks in this lane. 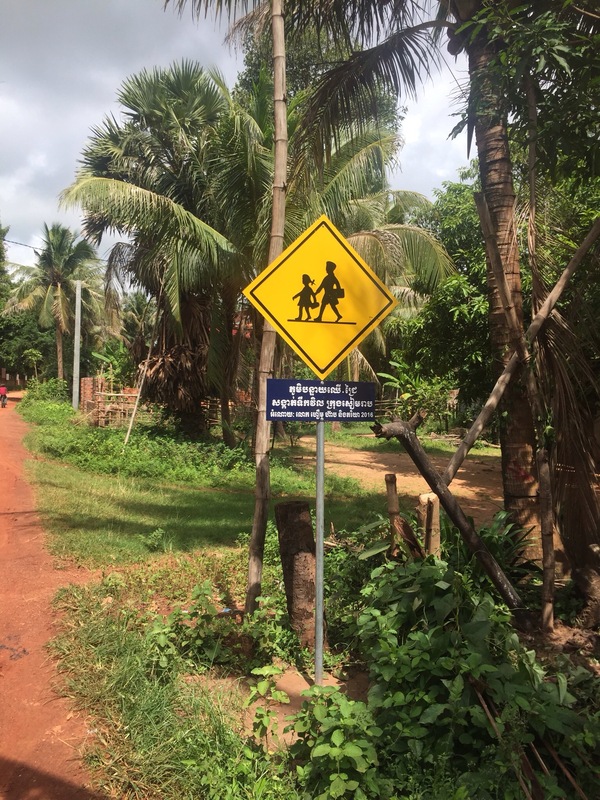 Surprisingly, this sign was actually respected in Siem Reap where they had separate divided lanes for tuk tuks and motorbikes. There is no “I” in team! We are all in this together cambodian people! Heres’ one where you just project your own feelings onto the “no” sign. I just started singing “No woman no cry” everytime. Here are the limbo players! Watch out!! Or, you may be struck by Zeus and given superhero powers. I can’t decide. 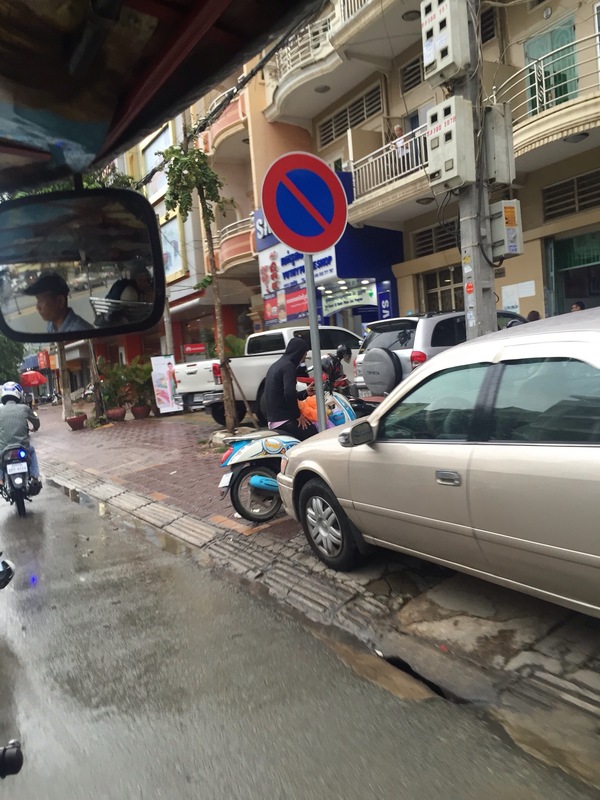 And last but not least, our official theme song of Cambodia, sung whenever, well, we got caught in the rain. Do you know what percentage of our giving goes to these organizations? I need to know before I commit?